Random bits and pieces that interest me, that I would like to share. Pete came up to see us yesterday, and we sat about chatting and catching up, and generally relaxing as Pete was feeling under the weather with a cold. Mas made a nice meal, and for the rest of the day we lurked about cheerfully, Pete playing with Salty from time to time too. Today is my birthday and Pete gave me Olivier Messiaen's Quartet for the End of Time. Maheena called round with a present, and I gave her one for Varun as it is his birthday too. Mas, Pete and I went to The Man in the Moon for lunch. It was so nice to have a glass of red wine that tasted of red wine, and things seeming normal again. After this we got a little shopping which included a cat collar. When we were home Pete and I listened to my new CD, and when he and Mas went off to watch something on the TV, I made some banana bread. Later Mas made a nice meal, and we watched a Battlestar Gallactica, and put in some more earnest relaxing. On Saturday Mas was feeling rather depressed and end of yearish, but we did our usual things and tried to have a reasonable day in spite of this, and watched something on TV in the evening. Today, Sunday, we went to Tania and Robert's home at midday, as we had been invited for lunch together with some relatives and friends; in total there was nine of us. The weather was cold and bright, and when we arrived we joined the others and had some welcome mulled wine and mince pies. We all chatted while we waited for the Christmas dinner to be served; Tania's relatives were laughing a lot, and we soon found out why. Apparently Tania had bought such a huge turkey that it would not fit into her oven, as she also wanted to roast some vegetables. Seeing the dilemma, Tania had secretly dug a huge hole in the garden the previous day, as you do, and put in some charcoal. Today she slipped out of bed before Robert was awake, so avoiding inevitable criticism. She then set fire to the charcoal and placed the turkey into the hole and covering it carefully, and filled in the hole with earth again. The relatives kept asking Tania to open it up, to see how it was going, but as Tania pointed out it would let all the heat out. 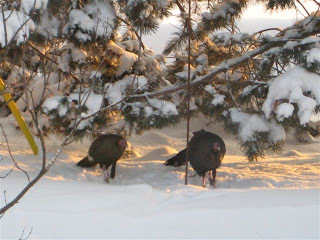 I was shown the site where the turkey was planted, and a thin trickle of smoke or steam was rising from the soil. There were many jokes about the turkey having the Last Rites, and people tapping their watches and laughing. The smoke alarm went off twice, adding to the hilarity. Eventually Tania dug up the turkey, only to find that it had not really cooked all through; one of the friends gave an imitation of how the turkey looked. As a precaution Tania had also cooked a small turkey without legs, and diner was soon served with all the festive fixings to go with it, and was delicious. After this Tania bought in a traditional Christmas pudding, complaining that it would not catch fire as she had poured lots of rum on it (more laughter), and then a cheese cake with chopped fresh fruit in it; when asked what the fruit was, Tania replied that it was fresh piss, being unsure of the pronunciation, which caused another burst of laughter. Thinking about this later I suspect it was Persimmon, or Sharon fruit. Then to top this, a meringue was bought in with pomegranate and passion fruit sprinkled on top of it! At this point it would have been impossible to eat anything else, and we did not need the big turkey! gone, and a new crop of jokes was produced with more laughter. I think Tania is one of the most generous people I know, and she was joining in with the laughter too. I don't think I have ever been to a meal where everyone had so much to laugh about before, and I am sure none of us will forget it. On Christmas day we were woken at 9.30 am, which is late for us, by a neighbour. 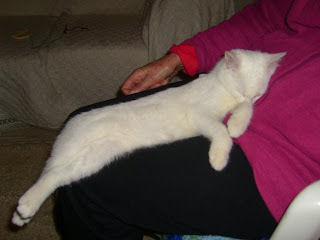 We had a very relaxed day talking and watching TV. Pete called, and we chatted for a while. We saw Harry Potter and the Prisoner of Azkaban, which we both thought was the best of these films that we had seen, and some of the Battlestar Gallacticas that Toby had sent. A cozy day with Salty in front of the fire; we tried out the new laser light cat toy, but he got so excited we had to stop after a short time. On Boxing Day Monica phoned to postpone our visit as she was, sadly, feeling rather ill, but the boys were feeling better by now. We had a surprise call from Eileen saying that she and my brother Alex would be in our neighbourhood in the evening, and could they visit us, and so they arrived later bearing whisky based mince pies and a bottle of wine. We sat in front of the fire chatting about their holiday; visiting St. Petersburge, Estonia and Finland, while Alex played with Salty. It was nice to see them both. This week we spent a lot of time watching TV, and contacting friends. On Christmas Eve we went up to St. Albans and met Robert and Tania at the Bua Thai restaurant where as usual we had a lovely meal and had lots to talk about. As we left the restaurant it was getting dark, and the market was lit up, and so were the decorations. It looked very cheerful, sadly I had forgotten to take my camera. We drove home, and unpacked the fruit and vegetables. Maheena called round bringing Christmas presents, and we had some herb tea and cake, and as usual with Maheena we had a lot to laugh about. Today is worth celebrating as it is the shortest day, and the days will lengthen from now on. Mas and I went off for an earlyish and slow breakfast at The Man in the Moon, after our usual waking up coffees. It was a nice bright day, and afterwards we got some shopping before returning home. Monika phoned to check her intended menu for Boxing Day, and to try and persuade us to accept a lift from Oktay on that day. Milan was not feeling well, so she said she would phone to confirm our arrangements on Boxing Day. In the evening we finished watching Pete's Frasiers, and looked at another one of our sci-fi series. Today as usual, I took Salty into the garden, after a brief but dangerous struggle to put his halter on. He went happily round the garden and he sharpened his claws on several trees, trying desperately to sprint up them all, but being restrained by me. As we were coming back, Mas came into the garden, and before I noticed, Salty had got free from the halter and had rushed to the side gate that leads to the front garden and road, and I rushed after him. Salty turned to face me and hissed, which was a first for him, and surprised me too! Later Mas was sitting in the kitchen chatting, with Salty on his knees, and they were both watching me while I took the lentil and vegetable soup I had made, and put it in the blender. Without thinking I turned on the blender which is very loud, and the cat sprang upwards and backwards and was plastered on Mason's face which had also caused Mas to do one of his startled jumps for which he is rightly famous. The cat shot away, and it was along time before Mas and I could stop laughing, and go to find him. In the evening we began watching Battlestar Gallactica which Mas had been looking forward to. On Friday Glen came round as planned during the morning and we had biscuits and sherry and generally put the world to rights. At seven we walked round to John and Margaret's where eleven of the usual suspects were gathered. As usual they had prepared a wonderful spread of tasty party food which we all enjoyed. We all had a really nice time chatting, and we suddenly discovered it was almost midnight, and went our separate ways home. When we arrived home, we found that Salty had taken off all the small decorative birds that Tania had stuck on the holly wreath that she had given us, and had carried about a dozen of them all over the house, and there were toys strewn about everywhere too. On Wednesday Glen called in bringing a large Barra Brieth, Welsh spotted bread which is fruity and delicious; she was surprised at how large Salty is now. Mas received a present from Romy and Tobe which pleased and surprised him. I went for a short walk posting letters and delivering cards to neighbours. The computers were misbehaving all day and it seems that AOl were having problems too, so this kept Mas busy and frustrated most of the day. For a break we watched Merlin and later the dreary Wallender again. On Monday I received a lovely surprise Christmas present from Diane, so I phoned her later, and she seemed in very good spirits which was nice too. Salty on the other hand, seemed to have disapproved of the economy litter we had bought for him to use, and had dug up a planter in the conservatory and used that, but he had obviously enjoyed using earth and had thrown it all over the floor and window sills with great enthusiasm. I put it all together again, covering the earth with black plastic and orange peel, and put the more expensive litter back in his tray! 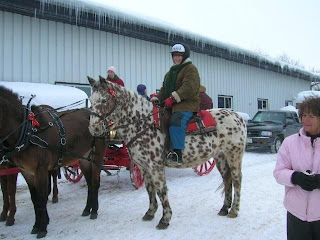 Joan sent some pictures, one with this unusual horse, a Gaited Leopard Appaloosa who is 26 years old. 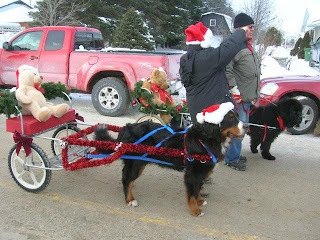 This is a Bernese Mountain Dog. Every year in a village not too far away from where they live there is an All Animal Christmas Parade, but it is possible to see the owners and talk to them. We got up fairly early today as I had to go to the hospital again. Mas gave me a lift to the station and I took the tube to Belsize Park. Once in the hospital I went to the general surgery clinic and saw a surgeon and we discussed my progress. It was decided that I should have various tests next year, and a follow up appointment in June. I will be monitored by my usual department in the meantime, and have contacts should any problems arise. I left feeling optimistic. As it was a nice day I walked up through Hampstead, calling in at the Post Office on the way, and being generally pleased that I was alive and a lot of things seem right with the world. I went home and had a catnap with the cat. On Saturday we went shopping and had lunch at The Man in the Moon where it was surprisingly quiet for a Saturday,but it was pouring with rain. Later I spoke to Diane who seemed rather cheerful, and later to Toby who was also cheerful. 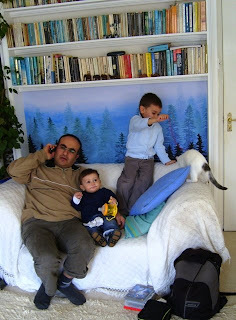 We watched a very good Italian film, which we are hoping will be a new series, called Inspector Montalbano. It showed lots of interesting scenery, and the characters were very nice and unusual. This caused us to stay up much later than usual, but we still had to play Salty's special mouse game before we could go up to bed! This morning we received a package from Switzerland. Christian sent us a series of CDs he had made for us which we will enjoy looking at. Monika phoned with another kind invitation. 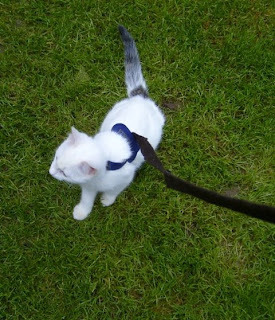 As Salty enjoys going out so much that he trembles with joy I made him a harness to wear so that he can walk about in the garden rather than me holding him. Just now we are frightened to give him full freedom until he is older and can find his way home again. In the evening we watched Quigley down under which starred Tom Sellick as a cowboy in Australia. This was an interesting film which showed the abuse of the Australian native people by the settlers, but in a fictional format. On Wednesday we drove off to St. Albans, and got our shopping from the market early as it was very cold. We were happy to meet up with Tania and Robert and drink some nice hot jasmin tea in our usual Thai restaurant and have lunch. Tania had bought us a holly wreath that she had made for us, which will be the first decoration we put up. When we left the restaurant it had got even colder, all the traders were blue, and on the fish stall the fresh fish were frozen rigid and I knew how they felt! It was 3° as we drove home. We had a beautiful drive home, the sky was translucent with the afterglow of the sunset, and there was an almost full moon in the sky. We were glad to get indoors and have a hot cup of tea before we put our groceries away. On Tuesday morning we put Salty into the cage we had borrowed from a neighbour and drove off to the vets in Boreham Wood. Salty went through his entire repertoire of meows, biting and scratching the plastic cage in between. Once with the vet, Salty was the model of sweetness and good behaviour which lasted until we were back in the car again. The vet gave Salty an injection in his neck which he did not seem to notice at all, and we left with a worm pill to give him in two weeks time. Irish hospitality and over eating. On Monday, as arranged, we picked up Margaret and John and drove off to Hendon where we were meeting Christiane and Eddie at an Irish pub called The Claddach Ring. We had a lovely three course meal together, wearing paper hats. Christiane and Eddie had bought Christmas gifts with them, and we had a very cheerful time. We were all so full, that we had to take home the mince pie that was served with the coffee to eat much later. We certainly did not need an eveni ng meal either. That was a fun occasion. Sunday 7th, we got some shopping.Later I began to do some of my Christmas cards; Mas has already done most of the family cards. We watched 'Allo 'Allo and Diagnosis Murder for an afternoon break. In the evening we watched another episode of Wallender which, to me, is rather like watching paint dry, especially as everyone seems reluctant to answer a direct question or act spontaneously, and we have to go through every nuance of facial expression before any action is taken. Apart from that it is gorgeous. 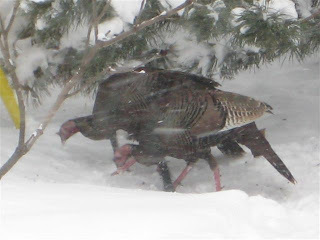 Joan sent pictures of wild turkeys taken through her kitchen window! The postman called while we were having breakfast. I received a parcel from Tobe and Romy containing some beautiful wool made by the Fleece Artist in dark bluey greens and some black wool to knit a beret with, and some bamboo knitting needles. I can hardly wait for my hands to be healed enough so that I can begin knitting! Also included in the parcel was enough of my favourite soap to last a year; what a luxury. Monika, Oktay, Milan and baby Radovan arrived as planned, and we had a lot of talk to catch up with. 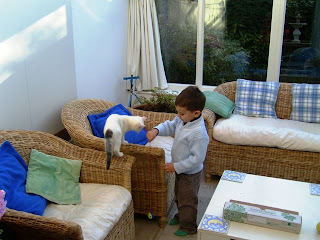 Monika is frightened of cats, which I had not known, but she let the children play and touch him so that they would not be made to fear cats as well. Salty was on his best behaviour, and although he fights me with tooth and claw was really gentle with the children. Later we were invited to go for a Chinese meal in Edgware which we enjoyed. The restaurant was cheerful and busy, and the meal was self service where people were invited to eat as much as they could. I also enjoyed tickling Milan who has an infectious laugh. It was a nice day. We woke up to a severe frost, and found that someone had skidded on the corner and crashed into the car parked in front of ours which had been knocked into our car. Luckily there was not much damage to our car, and we decided to ignore it as it was mainly cosmetic. 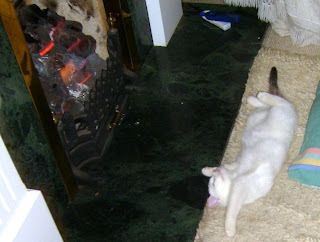 As it was so cold we lurked indoors most of the day. Monika phoned, and arranged to call in to see us tomorrow as they have to visit Edgware anyway. On Wednesday was very cold and frosty, and as Tania and Robert could not meet us today we did not go to St. Albans as usual, but we got some essential shopping and had lunch at The Man in the Moon. 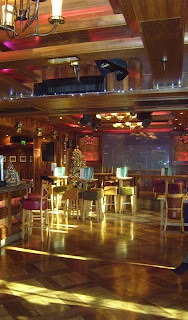 There were two jolly groups of people having an early Christmas get together which was cheerful. We went home again, and spent the rest of the day keeping warm indoors. Thursday was wet and cold. I had a surprise e-mail from Ruth, and in the evening we watched another episode of Wallender which was even more depressing than the last one. We also watched one of a series called Apparitions with Martin Shaw as the priest who does exorcisms. This was also depressing! We switched to Frasier for a little light relief. Today it was frosty outside, and I went to The Royal Free Hospital again, after another blood test I was advised that the medication was having too toxic an effect on me and that I had better not take the last course of pills. Diane was also attending the hospital, and we met up after we had finished our appointments. We walked to the nearest pub called The George, which was previously known as The Rat and Parrot. We had a drink, me having my present favourite of Ginger Beer, and caught up a bit before going off on the tube in different directions. Today we relaxed and had a slow breakfast appreciating our coffee. 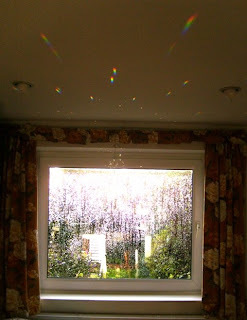 The sun was shining, making rainbows and sparkles all over the ceiling and wall of the dining room because of the chrystal that is suspended in front of the window. Salty, the kitten, spent ages springing at the wall trying to catch the moving sparkles, and pouncing on the ones on the carpet. I think we should have named him Sir Pouncealot. I am an artist living in North London, now able to spend my time creatively.